Department of Botany, The University of Texas at Austin. Thesis: Studies on the uptake and integration of foreign DNA in plant cells. 1. R. Malcolm Brown, Jr. and Inder M. Saxena. USDA Grant. Genetic analysis of cellulose biosynthesis in Acetobacter xylinum. 9/1/96-8/31/98. 2. R. Malcolm Brown, Jr. and Inder M. Saxena. USDA Grant. Molecular analysis of cellulose biosynthesis in Acetobacter xylinum. 9/1/93-8/31/95. 3. R. Malcolm Brown, Jr. and Inder M. Saxena. USDA Grant. Molecular analysis of cellulose biosynthesis in Acetobacter xylinum. 9/1/92-8/31/93. 1. Saxena, I. M., F. C. Lin, and R. M. Brown, Jr. 1995. Recombinant Cellulose Synthase. (U.S.Patent application). UTSB#564. 2. Saxena, I. M., E. M. Roberts, and R. M. Brown, Jr. 1990. Modification of cellulose normally synthesized by cellulose-producing microorganisms. U.S.Patent 4,950,597. 3. Saxena, I. M., and R. M. Brown, Jr. 1995. Identification of a second cellulose synthase gene (acsAll) in Acetobacter xylinum. J. Bacteriol. 177: 5276- 5283. 4. Saxena, I. M., R. M. Brown, Jr., M. Fevre, R. A. Geremia, and B. Henrissat. 1995. Multidomain architecture of glycosyl transferases: Implications for mechanism of action. J. Bacteriol. 177:1419-1424. 6. Saxena, I. M., F. C. Lin, and R. M. Brown, Jr. 1991. Identification of a new gene in an operon for cellulose biosynthesis in Acetobacter xylinum. Plant Mol Biol. 16: 947-954. 7. Saxena, I. M., F. C. Lin and R. M. Brown, Jr. 1990. Cloning and sequencing of the cellulose synthase catalytic subunit gene of Acetobacter xylinum. Plant Mol Biol. 15: 673-683. 8. Saxena, I. M., and R. M. Brown, Jr. 1989. Cellulose biosynthesis in Acetobacter xylinum: A genetic approach. In : Schuerch, C. (ed) Cellulose and Wood - Chemistry and Technology, pp 537-557. John Wiley and Sons, New York. 9. Roberts, E., I. M. Saxena, and R. M. Brown, Jr. 1989a. Biosynthesis of cellulose II. In : Schuerch, C. (ed) Cellulose and Wood - Chemistry and Technology, pp 689-704. John Wiley and Sons, New York. 10. Roberts, E., I. M. Saxena, and R. M. Brown, Jr. 1989b. Does cellulose II occur in nature? In : Bailey, G. W. (ed) Proceedings of the 47th Annual Meeting of the Electron Microscopy Society of America, pp 780-781. 11. Gupta, A., I. M. Saxena, S. K. Sopory, and S. Guha-Mukherjee. 1983a. Regulation of nitrate-reductase synthesis during early germination in seeds of barley (Hordeum vulgare). Journal of Experimental Botany 34:34-46. 12. Gupta, A., S. Disa, I. M. Saxena, N. B. Sarin, S. Guha-Mukherjee, and S. K. Sopory. 1983b. Role of nitrate in the induction of nitrite-reductase activity during wheat seed germination. Journal of Experimental Botany 34:396-404. 13. Ramaswamy, O., I. M. Saxena, S. Guha-Mukherjee, and S. K. Sopory. 1983. Phytochrome regulation of nitrate-reductase in wheat. Journal of Biosciences 5:63-70. 14. Saxena, I. M., and R. M. Brown, Jr. 1997. IS 1238: a new mobile insertion sequence element from Acetobacter xylinum. protoplasts. These studies involved the techniques of plant cell and tissue culture, and DNA isolation and analysis from bothbacterial and plant sources. In the same period, I was also involved in studies on nitrate assimilation in higher plants (Gupta) et al., 1983a and 1983b; Ramaswamy et al., 1983), and continued this work by analyzing nitrate reductase-deficient mutants of Nicotiana tabacum till December 1985. Since January 1986, 1 have been studying cellulose biosynthesis in the bacterium Acetobacter xylinum (Saxena and Brown, 1989; Roberts at al., 1989a and 1989b). These studies led to the identification of genes for cellulose biosynthesis for the first time from any organism (Saxena et al., 1990 and 1991). During the same period, a group from Cetus Corp. also identified a similar set of genes from A. xylinum. The A. xylinum genes for cellulose biosynthesis were characterized by isolation of insertion mutants (Saxena at al., 1994), and subsequently a second gene encoding for cellulose synt~iase activity was described in this bacterium (Saxena and Brown., 1995). Comparison of the A. xylinum cellulose synthase sequence with other O- glycosyltransferases using hydrophobic cluster analysis (HCA) led to the identification of conserved domains in these proteins and the prediction of catalytic residues (Saxena et al., 1995). Putative catalytic residues in the A. xylinum cellulose synthase have been analyzed by site-directed mutagenesis (Saxena and Brown, 1997). In the course of my research work, I have used a variety of approaches and techniques to get an overall picture of the process under investigation (Brown at al., 1996). As a result I have experience of working in the broad areas of genetics, biochemistry, microbiology and plant biology, utilizing techniques of cell and molecular biology for my studies. 1. 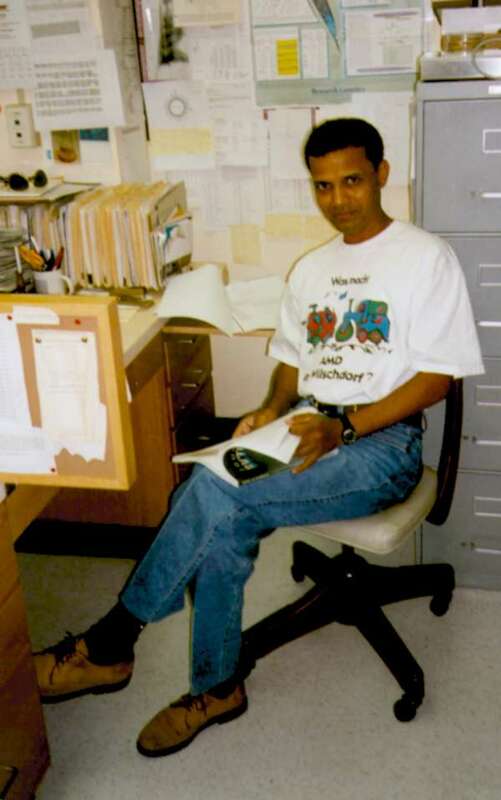 Teaching Cell Biology (BOT 323K) to undergraduate students at the University of Texas at Austin since August 1996. 2. Training undergraduate students (three, at present) for research in molecular biology. Glycosyltransferases involved in the biosynthesis of oligosaccharide and polysaccharide chains. synthesis of oligo/polysaccharide chains of desired length. A number of these experiments will be done using the cellulose synthase genes from bacteria as well as those from higher plants. I am also interested in determining the structure of a glycosyltransferase, specifically cellulose synthase, where the catalytic site is predicted to bind at least two sugar residues in an orientation that allows these residues to be positioned 180" with respect to each other in the polysaccharide backbone.